Decades ago, the Marsalis kids had their notion of fun. Branford, 13, and Wynton, 12, would find white Marsalis families in Summit, Miss. PBS’s 10-part series “Finding Your Roots” illustrates how researchers never quite know what they’ll find when looking into family history, whether it’s in a public record, through the Internet or a story passed down from generations. “Finding your Roots,” which premieres Sunday, March 25, at 7 p.m. on KUED, Ch. 7, is hosted by Henry Louis Gates Jr., the Alphonse Fletcher University Professor at Harvard University. The series looks into the family history of notable names like Samuel L. Jackson, Barbara Walters and Robert Downey Jr. Gates invites all to look back in their family lines and find what it is that makes them who they are. The premiere episode features guest biographies of musician/actor Harry Connick Jr. and composer/band leader Branford Marsalis. The two are “dear friends” who grew up together in New Orleans with its rich musical heritage. “It’s often been said that people in New Orleans don’t just tell history, they do history,” Gates says. “Genealogists help stitch together the past, using the paper trail their ancestors left behind,” Gates says. Two paths, one place: The ties that bind Branford Marsalis and Harry Connick Jr.
For a video featuring Branford and Harry, please visit the USA Weekend website. 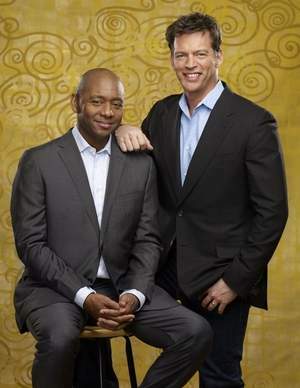 “Ready to go?” Branford Marsalis prods Harry Connick Jr., placing his hands on Connick’s shoulders. The celebrated musicians and old friends are at a New York rehearsal hall for a photo shoot, but Connick can’t pry himself away from the piano. It’s surely a familiar sight for Marsalis, 51, whose father, Ellis, gave Connick, 44, lessons more than four decades ago in their shared hometown, New Orleans. Connick and Marsalis have remained close friends and collaborate on musical and philanthropic projects, such as supporting artists in their native city after Hurricane Katrina. Now, on Sunday’s Finding Your Roots With Henry Louis Gates, Jr. on PBS, it is revealed that while their ancestors charted very different paths, the family trees were shaped by common historical events. Both have European ancestors who landed in the South. Marsalis’ maternal great-great-great-grandfather, John Reinhart Learson, immigrated to New Orleans from Germany before the Civil War. The name Marsalis, however, actually was taken from his great-grandfather’s stepfather. “My actual great-great-grandfather was a man named Isaac Black,” Marsalis notes. But Marsalis said he’s never really sought the spotlight. Marsalis, 51, is scheduled to perform Thursday in Southern Pines for the opening night of the Palustris Festival. He will be joined by pianist Joey Calderazzo. A native of Louisiana, Marsalis grew up in a musical family. His father, Ellis Marsalis Jr.; and brothers Wynton, Jason and Delfeayo are all jazz musicians. In 1980, while still a student at Berklee College of Music, Marsalis toured Europe in an ensemble led by drummer Art Blakey. He went on to play with Lionel Hampton and Clark Terry before joining brother Wynton in Blakey’s Jazz Messengers. In 1985, Marsalis began an association with Sting, playing on his “The Dream of the Blue Turtles” album. From 1992 to ‘95, the saxophonist was the leader of “The Tonight Show” band. Observer: What was it like growing up in such a musical family? Was there a lot of competition? Yes, Branford Marsalis toured with Sting . Yes, he did two years on “The Tonight Show” with Jay Leno. But, while it might make a good line or two in a lengthy biography, it’s far from who the brilliant saxophonist is. One may as well have found the credits on a cave wall. “One thing I did learn from ‘The Tonight Show’ is that unless you’re on TV, people don’t know who you are,” Marsalis said. Most folks who have picked up a horn — or even have a mere passive interest in jazz — in the last 30 years likely know of Marsalis. And if it’s not Branford, it’s brother Wynton or the patriarch of the jazz-playing family, Ellis Marsalis. It’s been a life of jazz — and, more recently, classical — that keeps the father of three motivated. Not that the scene, the industry or his own body haven’t change through nearly 30 recordings as The Lead Guy and more than 50 recordings as a sideman. But he continues. The Marsalis Music label he founded in 2002. He won the 2010 Drama Desk Award for “Best Music in a Advertisement Play” in the Broadway revival of “Fences.” And he released, “The Songs of Mirth and Melancholy” duo with Joey Calderazzo in 2011. Aside from the celebrity of American saxophonist Branford Marsalis appearing here in a classical program with the Borusan Philharmonic, conducted by Sascha Goetzel, there was another cause célèbre, in my opinion, at the unusual concert at Lütfi Kırdar Concert Hall on Feb. 23. The most familiar classical composer in the line-up was Sergei Prokofiev, with other, lesser-known works by film composer John Williams, Sally Beamish, and Erwin Schulhoff. The latter, a Czech whose music was banned by the Nazis and who perished in a German concentration camp in 1942, produced a unique body of work in his short life, and some of it was during his time as a prisoner. Two of his extraordinary compositions shared the spotlight with the soloist of the evening.